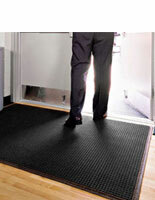 These black entry mats are made of rubber and absorbent polypropylene fibers. 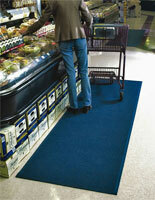 The carpeting is great for retail stores, supermarkets and restaurants. 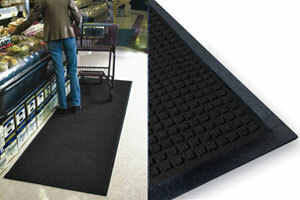 Each of the entry mats features a rectangular shape and measures 3' x 10', allowing them to cover a large area. The rubber rugs are also anti-static rated at 1.2KV by the AATCC and Certified slip resistant by the National Floor Safety Institute. 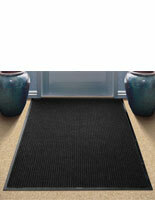 The absorbent mats feature a neutral charcoal finish that goes with any environment. The carpeting for malls and retail stores is also available in blue, navy blue and gray.